“The price of power may have been private assurances that aspects of the security establishment would be left untouched” Intelligence Expert at Georgetown University. IN ITS three decades of existence, the ruling Ethiopian People’s Revolutionary Democratic Front (EPRDF) has gone through only two leaders. Neither came to power through a competitive vote. So it was with a sense of novelty that Ethiopians awaited the outcome of a secret ballot held on March 27th to determine the new chairman of the coalition and, by extension, the country’s prime minister. The result was also historic. Abiy Ahmed (pictured) won the backing of 108 party bigwigs, while 59 went for Shiferaw Shigute, his closest rival. 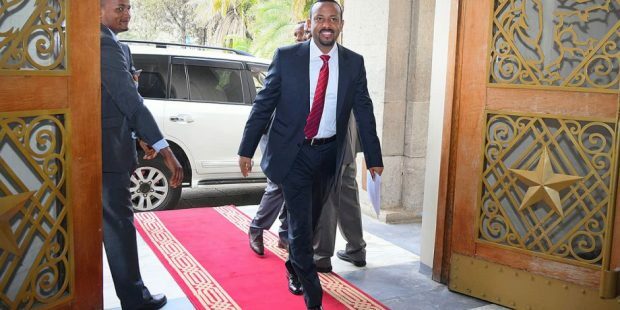 On April 2nd Mr Abiy was sworn in as prime minister, making the 42-year-old Africa’s youngest leader. He will also be the first in modern Ethiopian history to identify as Oromo—from the largest, and lately the most rebellious, of the country’s ethnic groups. The region of Oromia has been the scene of deadly anti-government protests for more than three years. 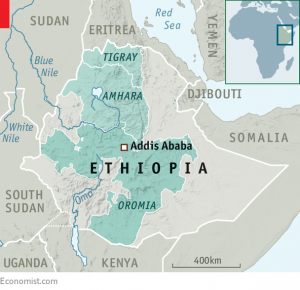 Anger over land seizures and government repression is compounded by a belief that other ethnic groups, such as the Amharas and Tigrayans, have for centuries conspired to keep Oromos out of power. The government reimposed a state of emergency in February after the resignation of the last prime minister, Hailemariam Desalegn. Mr Abiy’s rise has eased tensions, for now. He takes office on a wave of goodwill. Taxis across Oromia are emblazoned with his photo. Activists abroad tweeted their support. Even in Addis Ababa, the capital, where locals are wary of his ethnic nationalism, there is optimism. In his inaugural speech Mr Abiy apologised for the government’s killing of protesters. He called for unity and talks with opposition groups. And he promised to make peace with Eritrea, Ethiopia’s long-standing enemy. “He sounded like Obama,” gushes Asrat Abera, a resident of the capital. The appointment of Mr Abiy reflects a shift in the balance of power in the EPRDF. His Oromo People’s Democratic Organisation (OPDO) now takes the helm of the coalition, which had been dominated by the Tigrayan People’s Liberation Front (TPLF). 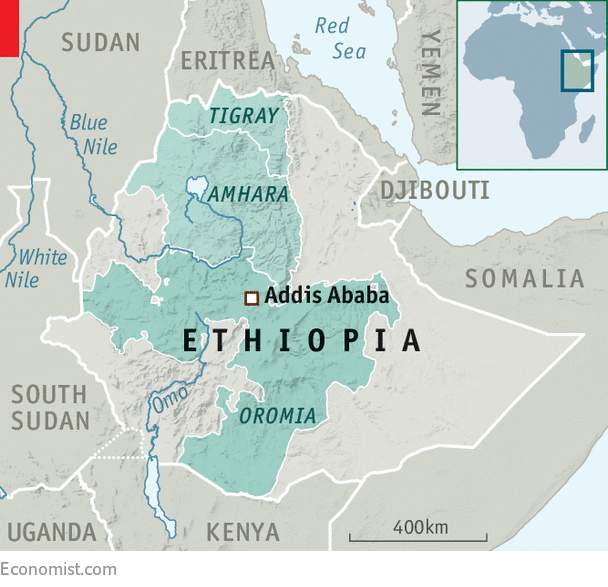 The TPLF represents Tigrayans, who form only about 6% of the population, whereas Oromos make up over 30%. Many in the Amhara National Democratic Movement, the coalition’s Amhara wing, also bristled at the TPLF’s power. Its candidate for chairman, Demeke Mekonnen, the deputy prime minister, withdrew at the last minute. Mr Hailemariam’s Southern Ethiopian People’s Democratic Movement also brought Mr Abiy crucial votes. The new prime minister faces two daunting challenges. The first is to reunite the EPRDF, which has suffered from infighting ever since Meles Zenawi, its first leader, died in 2012. Before the vote, Mr Abiy and his OPDO colleagues were subjected to criticism from all wings of the coalition. Many resent his ambition and suspect him of using unrest in Oromia for political advantage. Some think he and Lemma Megersa, Oromia’s popular president, turned a blind eye to attacks on non-Oromos. TPLF supporters accused the OPDO of fomenting a Western-sponsored revolution. Mr Abiy’s second task is to enact the reforms he and Mr Lemma have long promised. After taking over the OPDO’s leadership in 2016, “Team Lemma”, as the reformers are known, rebranded the party as a quasi-opposition. They adopted the protesters’ demands for greater Oromo representation in government and the release of political prisoners. They criticised the army for killing Oromo protesters. In an act of defiance, 88 MPs, mostly from Oromia, voted against ratifying the state of emergency last month. Mr Abiy abstained. Sceptics note that Mr Abiy is a product of the old political system. He joined the OPDO in his teens. “Some of his chief mentors were TPLF-ites,” says an analyst in the capital. In the late 2000s he helped set up a controversial online surveillance network. His background may have made him more palatable to hardliners in the EPRDF than Mr Lemma, who was once a more likely prime minister. The price of power may have been private assurances that aspects of the security establishment would be left untouched, says Harry Verhoeven of Georgetown University. ጥንቆላ ነው!!??? ወይስ ስንዘራ?? እባካችሁ ኣታስቁን!!! ተረት ተረት እኮ ኣሁንም ህፃናት መሃል ኣልቀረም!! Mulew – can you respond to this or are you conveniently avoiding it? Abiy is the pm – so get over it! He has wider support than HMD and that traitorous MZ of yours – who is son and grand son of bandas – so get over this one as well!! Go to TOL or Aiga and vomit your ethnic hatred – leave this alone! A pig with a lipstick can be excused for pretending to be a puppy or a kitty – still a pig! ሙሌው ምነ በሰላም አገር ነገር ነገር ነገር ‘ጠብ ያለሽ በዳቦ’ ያስብሎታል ከመሬት ተነስተው? የእርሶ ጀጋኑዋ ኢሕአዴግ ወ ወያኔ ራዲዎኑን፣ ቴሌቭዥኑን፣ አንድ-ለ-አምስቱን እንደው ያለ የለለ ገገማ ፕሮፖጋንዳዋን ስትነዛ እኛ ደግሞ ትንሽ መተንፈሻ – ዕድሜ ለኢንተርኔት – ብናገኝ እርሶን እንዲህ አብሰለሰሎት? ሃሰት ከመስሎት፡ ጥሩንበኛም ከሆነ እንደው ካልተስማማዎት ምክኛቶን ዘርዝረው ይጣፉ። እንደው ናድ ናድ ባያርጎት ምን አለበት? እንደ እርሶ ያሉ ‘ሁለቴ እንዴት አደሩ አንዱ ለነገር ነው’ ባይ የሠፈራችን ሙጢ ‘ወ/ሮ ማሲንቆ’ ነበር የሴትዬይቱ ስም። ምነዋ ባልተቃኘ ማሲንቆዎ ጆሮ ሰቅጣጭ ‘ድምፅ’ ለቀቁንብንሳ? ተዚህ በፊት እንደ ጣፉት – የወያኔይቱን ጀግንነት ያሳመሩ መስሎት – በአገር ክህደት የሚያስጠይቅ ውንንጀል ከሻቢያ ጋር ገጥመው የኢትዮጵያን ሠራዊት መውጋቶን አወጉን። ታዲያ በዛ ባሰላው የዕድሜ ባለጠጋ መሆኖን ያሳያል። ዛዲያሳ ምነ እንደ ዕድሜዎ አቅል ቢገዙ ጌታው ሙሌ? ኤዲያ! ያድምጡማ! ረጋ ይበሉዪ?